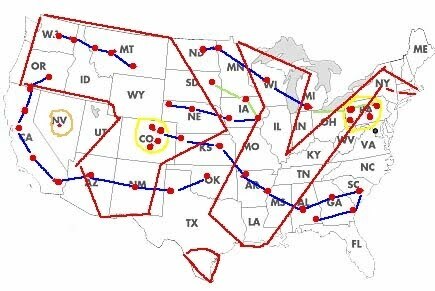 The Powers-That-Be seem to be ramping-up efforts to drive a stake right into America's heart(land). Natural disasters are on the rise, and an increasing amount of evidence is leading to the conclusion that these natural disasters might not be completely natural. Some already have speculated that we are entering a time of weather and earthquake wars, as the incidence of mega disasters has risen across the world. Is government experimentation simply going awry, or is it being orchestrated on purpose? Are they hiding behind or even amplifying current natural earth changes such as the strong solar cycle and the on-going magnetic pole shift to accomplish some furtive plot? The hidden hand has always cloaked itself using a wide array of techniques to conceal its divide-and-conquer agenda. By owning the ultimate weapon -- the very climate upon which we all depend -- entire regions can now be put under a full spectrum of remote control already served up through climate change, economic instability, and the military-surveillance complex brought in under the false threat of terrorism. Let's first look at the evidence for the manipulation of natural disasters and the proposed government solutions, then move to the massive preparation being undertaken by FEMA indicating that something big is on the way for the area of The New Madrid Fault as indicated by the current cluster of disasters in the region. We'll then finish with the solutions at our disposal to thwart the efforts of the elite cabal of gangsters that seeks control over humanity. Predictive Programming -- This is where the groundwork is laid for directing people toward an imagined future. Through books, video games, movies, propaganda placement, and education, the passive receiving of orchestrated information can literally change the future. Elites have always been obsessed with mind control . . . and the best form is that which is the least obvious. The unaware are manipulated and controlled without a single shot being fired, or a single piece of legislation written. However, once one becomes attuned to their methods, it becomes incredibly obvious. Besides the constant bombardment of mega-disaster and end of the world scenarios, one prime current example is geoengineering (aka chemtrails). This chemical spraying has now wormed into movies and public places as an example for children to embrace the new normal of planes laying down a tic-tac-toe murky gloom across our skies. 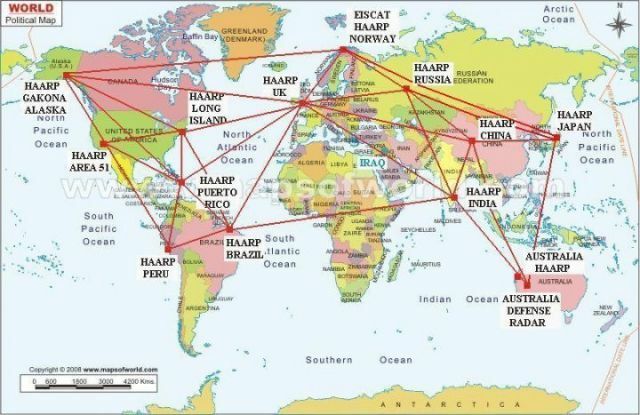 It is thought this weather manipulating technology is being tested and fine-tuned for worldwide use, as other such antenna arrays are located in Norway (EISCAT), Australia (Exmouth), and several other countries, as well as via space-based facilities. Benjamin Fulford is among those who claim to have spoken to insiders about specific threats made to Japan prior its 9.0 event. Video showing distinct vibrational patterns, as well as purported "punch holes" have been cited as evidence. Increased HAARP activity seems to correspond and, curiously, the HAARP site has been taken down. While the evidence that exists is somewhat tangential, HAARP's stated capabilities are indeed ground penetrating. Geoengineering -- This might be the most obvious part of the elite plan for global control. Books like Ecoscience by Obama's science czar, John Holdren; the military plans for Owning The Weather by 2025 ; and the recent Royal Society proclamations all point to a relatively small group of selected sociopaths who would love to play God with our climate, backed by ultra-elite front organizations such as the Bill & Melinda Gates Foundation. As described above, there already has been a conditioning program for people to accept seeing planes spray across the skies. Now, the evidence is in: it is a chemical cocktail which contains dangerous levels of toxic particulates such as barium and aluminum. Certainly Monsanto seems to have accepted this reality, as they were quick to develop an aluminum resistant gene to insert into their GM crops. The recent mega-twister outbreak, which has led scientists to conduct a disaster autopsy, might also point to evidence of weather modification experiments that are facilitated by the presence of heavy metals in chemtrails that intensify the effect of manipulative EMFs. 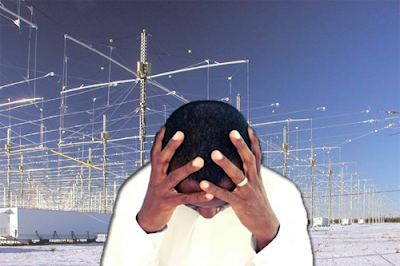 Electromagnetic Control -- It is known the toxic soup of electo-magnetic waves already in place through power lines, cell towers, WiFi, radio, television and a host of other broadcasting devices has a seriously deleterious effect on human health and mental well being. 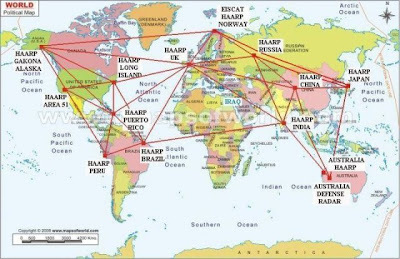 HAARP and its various localized outposts and GWEN towers (Ground Wave Emergency Network) has the known capability to affect human thought. 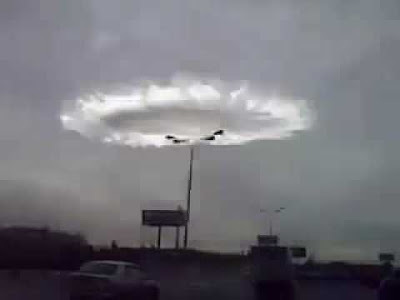 Another even more sinister capability using other inaudible ELF and UHF (extra low and ultra high frequency) electromagnetic signals is also in place since the 1990's. This secret program nicknamed the "sounds of silence" operates within the frequencies the brain operates on, and the PTBs have been piggy-backing inaudible, subliminal programming to manipulate humanity for decades. No wonder so many are entranced by the media and the country appears to be so upset, confused, fearful and divided. The Department of Defense even tested this Silent Sound Spread Spectrum (SSSS) technology during the first Iraq war, causing unwary battle-tested Iraqi soldiers to act like submissive children running to American troops for protection. It's also in use in the private sector and goes by the name of Silent Subliminal Presentation System and is used as an advanced marketing technique, among other things. It is believed this technology is one of the PTBs main tools being used for the subjugation of the American people. Big Oil and Gas Fracking -- Since September of 2010, nearly 800 earthquakes rattled Arkansas and the New Madrid Fault Line. The entire state only experienced 38 quakes in 2009. The New Madrid Zone is believed to be a part of a complex of faults that extends down the Mississippi Valley into The Gulf of Mexico. In fact, the oil volcano that was unleashed by the BP disaster last year is thought to be at the southern tip of this volatile area. Not only are oil and gas being extracted from beneath this zone at enormous rates, but an extraction process called fracking is further exacerbating seismic activity in the region and might even trigger a mega-quake. Hydraulic fracturing (fracking) pumps water and chemicals into the ground at a pressurized rate exceeding what the bedrock can withstand, resulting in a microquake that produces rock fractures. A close look at Arkansas’ history of earthquakes and drilling reveals a shockingly noticeable surge in quake frequency following advanced drilling. Fracking is now a global technique for finding natural gas. Animal Die-offs -- Perhaps the most puzzling, and one of the most alarming of unnatural phenomena recently has been the sudden and unexplained animal deaths. Many factors could be at play, but the increasingly apparent weather modification effort by the powers-that-be seems to be the primary suspect. Concentrated radio beams, both HAARP and local-based, have been detected in the very regions of these die-offs. The deliberate war on nature is also displayed by GM poisoning that is now leading bees to seal off parts of their hives as a defense mechanism. So, there are clearly elitists who wish to control populations en masse, and they are fully aware that much of their scientific experimentation with nature could have unintended consequences. For the eventuality of such chaos, they seem to be preparing to restore order with a rather harsh approach. Back in 2009 Shepard Ambellas brought to light a mass grave site in Phoenix, Arizona, replete with plastic coffins and FEMA camp complexes. 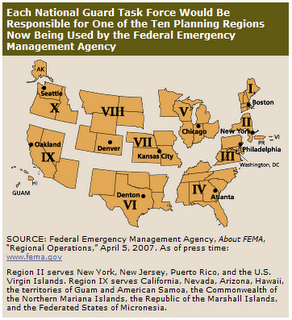 This has now been confirmed by many independent researchers, and is a theory endorsed by ex-governor and Conspiracy Theory host, Jesse Ventura, who was shocked to learn that this isn't a theory at all; there really is a continuity of government agenda with 10 proposed FEMA regions to be controlled by selected governors. In fact, this police state agenda is so real that outside pressure led to the episode being pulled after release, and even remotely erased from the DVRs of TiVo, Comcast, DirectTV and AT&T customers. Nothing to hide? No plans? Right. Doubters, or those who might feel comforted by the government's version of disaster preparation, would do well to remember FEMA's intervention following Hurricane Katrina and how horrendously that worked out for tens of thousands holed up in their stadium concentration camp where children weren't even immune from rapes and beatings. By connecting the following dots, one should see that whether or not the chaos is deliberate, accidental, or even natural, one should think twice before entering the FEMA version of Club Med when societal collapse arrives. --NLE 2011 -- FEMA's largest National Level Exercise in history has commenced. It reportedly involves over 1 million people. The states that are involved are those that already have experienced record tornado outbreaks, horrendous flooding, and consistent earthquake tremors. Now, the Army Corps of Engineers has detonated 250 tons of TNT in this fault zone to so-called mitigate flooding . Residents are now reporting that decontamination units have been set up as part of this "exercise". --FEMA has placed a rush order of $1 billion in dehydrated food. Homeland Security has ordered expedited printing of over 350,000 national emergency detainee handbooks. 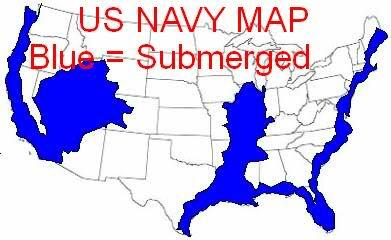 -The U.S. Navy released images of the future geography of America . . . divided nearly down the middle. As we consider the events that have taken place in this region over the recent past, there clearly is something major going on. Since Katrina we have witnessed dead birds and fish, increased earthquakes, The BP Disaster, and the worst disaster since Katrina: the mega-tornado outbreak. Regardless of the theories (and evidence) showing signs of an attempt to orchestrate a divide-and-conquer strategy for America, we would do well to prepare ourselves for an increasing number of these disasters, as well as to prepare for the official response. Of all the scams, the worldwide banking system is one of the most mind-boggling. Once you "buy into it" you're already ensnared, and it's either eat, or be eaten. That's their design. Never mind the entire false premise of fiat money and the debt system -- vast amounts of this illusory "currency" get shifted every micro-second in a wave of deceit and piracy. If we are to break free of our engineered financial shackles we must develop and promote competing currencies and barter systems. They are already trying to imprison people for doing just that, which is a sure sign that it is an Achilles heel. They can't lock up everyone, so get started now developing your own private currency and discussing alternatives to The Federal Reserve fiat system. This is the second main method of control the world over. Globalists use the IMF to literally use food as a weapon, which is exactly what was proposed in State Department Memorandum 200 from 1974 where Henry Kissinger addresses much of what we see happening across the globe in 2011. Food inflation already has begun in earnest, while environmental destruction is impacting food and water quality planet-wide. By all means begin by filtering your water . And it's never too late to learn off-the-grid methods for food production such as aquaponics and permaculture. If you find that food growing is simply not possible, then learn where your local growers are so that you can support the strength of the community that can help you best in times of crisis. Much has been made of the massive rise in doomsday bunker purchases, as well as purchases to enter self-sustaining underground communities. This path is certainly not for everyone, as the most serious disasters could last for an indeterminate length of time. Perhaps a better path is to stay mobile, rather than fixed. It is sad that many people have lost their permanent homes during the financial collapse; however, for those in such a position you might just be best suited toward survival. The ability to pick up and go has proven to be important as the fallout from the Fukushima disaster has circled the globe. There is always someplace safe; it is important to identify where that is and be prepared to move when necessary. Rather than "running for one's life" as a cowardly act, this should be viewed as running toward better opportunities when presented with adversity beyond one's control. All true survivalism depends on one's ability to physically adapt, then to have the mental fortitude to make the best from unfortunate circumstances. Some key areas of focus are radiation protection, plug-in scalar technology, orgonite and EMP protection. With recent news from NASA that Comet Elenin is affecting Earth , it would be wise to also move to higher ground if possible. We saved the best survival tactic for last. Ironically, the pooling of resources is the single most effective and inexpensive strategy to ensure your own independence. Disaster preparation can seem like an overwhelming task to take on single-handedly -- much better to befriend people who are already skilled (and well-stocked) in certain areas. Every community already has people well-trained in mechanics, craftsmanship, food production, and tactical weapons. Rather than try the nearly impossible task of gaining skills in all of these areas, offer your current skills, property, or ideas to other key people and strategize about what-if scenarios. Just such a project has begun in New Hampshire. The Free State project is a recruitment for liberty-loving people to move to New Hampshire. You can read their statement of intent to decide if this might be the path for you. This is a brilliant plan for people to connect with other like-minded individuals and carry out a shared goal. This erases the feeling of being alone, which lead so many people to inaction as they see their current neighbors turn a blind-eye to the problems we have outlined above. We all sincerely hope that we don't have to encounter a collapse scenario, but simple wishful thinking might not be enough; best to balance continued optimism with sound preparation. * Nicholas West is a frequent contributor to Activist Post writing on topics such as HAARP, predictive programming, and government conspiracies real and imagined. * Zen Gardner is the Contributing Editor for Alternative News at Before It’s News, and also posts at ZenGardner.com.